“The six works on this disk ( James Cohn - Concertos & Tone Poems) are high on charm and craftsmanship.” ~ CLASSICS TODAY. ~ AMERICAN RECORD GUIDE – September/October, 2008. Cohn moves easily into and out of ragtime, tangos, boogie-woogie, blues and waltzes, “just the thing for assuaging the pain of inspecting your latest 401K statement.” ~ AMERICAN RECORD GUIDE - March/April 2009. “Given the evidence supplied by these two releases, “Of Muskrats & Butterflies” XLNT Music, Inc. & Symphonies #2 & #7, Variations on the Wayfaring Stranger & the Waltz in D (Naxos), it is apparent that James Cohn takes great delight in his music making. As a result, so can we.” ~ William Zagorski – FANFARE – May/June, 2009. 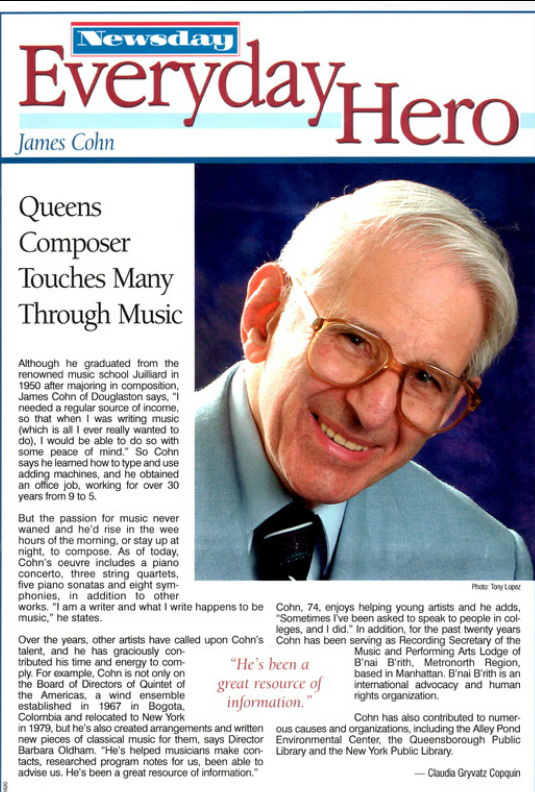 James Cohn was born in 1928 in Newark, New Jersey. He studied composition with Roy Harris, Wayne Barlow, and Bernard Wagenaar, whose conservative and largely tuneful influences are writ large in his music. The two symphonies demonstrate fine motivic development, resourceful and appealing harmonic structure, long-limbed melodic arcs in their slow movements, and stunning orchestration. It is clear that Cohn revels in the sonic possibilities of the orchestra and exploits them with uncommon mastery and delight, as if his favored medium were a vast musical playground. Variations on “The Wayfaring Stranger” depends as much upon its orchestral colors as it does on its harmonic manipulations for its success. The result is 11.5 minutes of gratifying and often hauntingly moving music. Cohn is fully at home in large-scale forms. Both symphonies—No. 7 composed in 1967, No. 2 in 1949—show a remarkable uniformity of utterance. This stems not from any lack of technical or emotional development over time, but from the strength of Cohn’s musical profile. One cannot mistake a Cohn work for that of anyone else. In sum, both works continue the mid-20th-century efflorescence of the American symphony, and do so with distinction. The Slovak Radio Symphony Orchestra, variously under Vakhtang Jordania and Kirk Trevor, provides incisive, vibrant, and beautifully balanced performances. The nine Miniatures, composed shortly after Cohn’s graduation from the Juilliard School of Music in 1950, demonstrate his mastery of scale. As the symphonies can be likened to novels, these Miniatures can be likened to poems—each a self-contained musical universe. The apt titles of some of these pieces—Variations on “Muskrat Ramble,” 5th Piano Sonata (a slightly “blue sonata”), Strutting Butterflies—show both Cohn’s sense of whimsy and his love of jazz, which organically permeates much of the music on this disc. The main offering is the ebullient Concerto for Piano and Orchestra. It was commissioned by pianist Mirian Conti, who plays it, as she does everything else on this release, with absolute technical security and total sympathy with its stylistic diversity, which ranges from jazz to tango. The melancholy little Waltz in D is the same piece—first conceived as an octet for brass instruments, then scored for a small orchestra, and finally worked into the solo piano piece found here—encountered in its orchestral garb on the Naxos disc. I found Cohn’s reworking of the tasty musical morsel illuminating. The Naxos disc was recorded back in 2001. I am assuming that it was first released on the XLNT label. The XLNT release was recorded in 2008. In both cases, Cohn served as executive producer, and in both cases the sound is uncommonly fine. The Naxos disc is particularly distinguished by its clarity of line. No instrumental voice is lost even in the most powerful and complex of tuttis, the dynamic range is huge by current standards, and instrumental colors are tangibly vivid. JAMES COHN: Symphonies Nos. 2 (1949) & 7 (1967); Variations on “The Wayfaring Stranger" (1960); Waltz in D (1957/1962) - Slovak Radio Symphony Orchestra/ Vakhtang Jordania & Kirk Trevor (Sym. 2 & Waltz) - Naxos Worthwhile works of an American composer who has Naxos to thank for the exposure the major labels have failed to give him. Cohn celebrated his 80th birthday this year. He graduated from Juilliard in 1950, having studied with Roy Harris, Wayne Barlow and Bernard Wagenaar. Most of his works are for symphony orchestra, although he has written three string quartets, five piano sonatas and much choral music. His music is usually tonal and often highly lyrical, with jazz elements occasionally heard in it. The composer was still a student when he wrote his Second Symphony, studying with Dutch composer Wagenaar. It’s third movement is based on a serial tone row, but used in a highly emotional fashion, similar to Berg. The Seventh is a longer work - nearly a half hour - and full of great contrasts in its themes: between thoughtful and explosive and between formal and nearly hysterical. Cohn’s Variations uses the Southern folksong popularized by Burl Ives for a series of 12 variations. The short and tuneful Waltz was created for a brass octet and then later orchestrated by Cohn. The Seventh Symphony by Newark-born James Cohn – and for that matter the Second - is in four movements. The first of these is busily insistent and has about it a touch or two of Hindemith and Prokofiev as does the piping hot finale which suggests the influence of Bartók’s Concerto for Orchestra. The Allegro cantabile is an exercise in pastoral calm – a rustic cross between his teacher Roy Harris and Copland and RVW. The salty Piston-like grotesquerie of the third movement is amusingly disquieting. The Second Symphony is a later student work written while he was studying with Bernard Wagenaar as a Juilliard graduation piece. The piece won a Queen Elisabeth of the Belgians Prize. Its first movement charms with grace but enlivens with a hard-jawed urgency. Bartók’s concerto returns in echo in the second movement and also in the busy originality and carhorn blurt, blare and military brashness of the finale. Serial procedures inhabit the third movement but as ever this is accomplished with great textural transparency. The Variations on ‘The Wayfaring Stranger’ deftly explores the country pastoral and is initiated by a long-winding cor anglais solo. The piece is cut from the same misty serenity as Vaughan Williams’ Dives and Lazarus and Moeran’s rhapsodies yet with a distinct Percy Grainger lilt. The Variation were premiered by Paul Paray with the Detroit Symphony who had also introduced Cohn’s Symphony No. 3 to the public. The little Waltz in D sidles and nudges its way into the memory. It merits a place next to the eruptive Grand Era dances in Barber’s Souvenirs and just ever so slightly recalling Ravel’s La Valse – just with less impressionistic miasma. The recording is as clear as a bell and the orchestra puts the music across well allowing for a suggestion of shrillness in the violins. The woodwind own a direct presence and appear to lean in towards the listener. One is certainly left intrigued to hear the remaining six symphonies. In addition there are three string quartets and five piano sonatas. Among much else there is also an opera, The Fall of the City premièred in Athens, Ohio, after winning the Ohio University Opera Award. Most pieces in these discs are fairly short, perfectly proportioned and all superbly crafted, so that the music never outstays its welcome. This often unpretentious and good-natured music is most refreshing and attractive. Moreover, the concertos display a remarkable resourcefulness (particularly evident in the Concertina Concerto), as do the somewhat unusual Sonata Romantica Op.18 (for double bass and piano) and the Sonata Robusta Op.55 (for bassoon and piano). Listening to these beautifully made pieces often had me thinking of Poulenc, Ibert and Sauguet, which – I think – gives a fairly good idea of what the music sounds like. Add to this, the not infrequent quotations of American hymn tunes or folk songs, which brings the composer into the orbit of American composers such as Copland or Thomson. Now, of course, I would really like to hear the symphonies for a fuller assessment of his achievement. ~ Rob Barnett - MusicWeb International. There seems to be an unmistakable and attractive American breadth and flavour to this music, not difficult to place as mid-century, and rewarding in the sound craftsmanship and spirit. ~ Patric Standford - "Music and Vision" U.K.